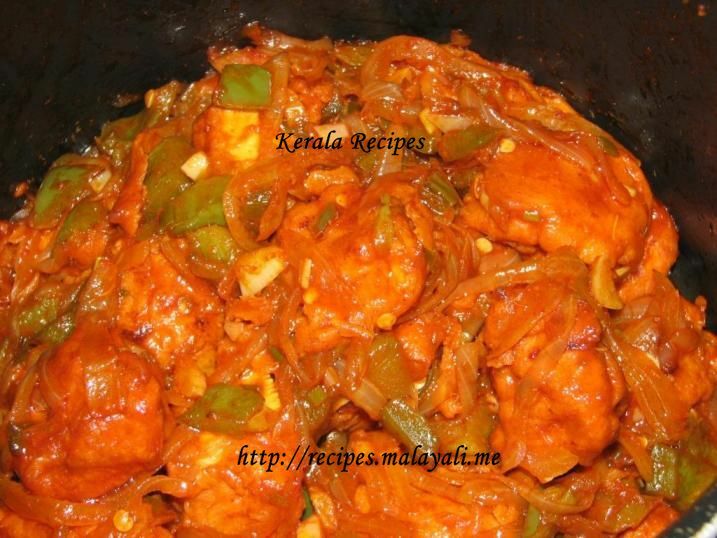 Here is the recipe for making a Spicy Kerala style Chilly Chicken. This goes well along with Fried Rice and Noodles. This Chilly Chicken is dry and doesn’t have much of a gravy. This is an excellent side dish or appetizer for Parties. Make a marinade with above ingredients. It should be in the form of a thick paste so that the chicken pieces get coated well. Add the chicken cubes and marinate it for an hour. You can leave it in the fridge for marination. Heat oil in a pan and deep fry the chicken pieces. Keep it aside and allow it to cool. Heat oil in another pan and saute the onions, spring onion whites, green chillies, ginger and garlic till the onions become translucent. Next add capsicum pieces and saute for 2-3 minutes. Reduce heat and stir in 1 tsp chilly powder, 3 tbsp tomato sauce, 2 tbsp hot and sweet red chilly sauce, 2 tbsp soy sauce and salt. Add the fried chicken pieces to the pan and toss everything so that the gravy is coated on the chicken. Add the spring onion greens and remove from heat after 2-3 minutes. If you want gravy for your Chilly Chicken, add 1 cup of water or stock after step 7 and bring it to a slow boil. To thicken the gravy, dissolve 1 tbsp of Corn Flour in 1/4 cup of warm water and add it to the chilly chicken. I tried this ….& couldn’t stop licking my fingers . Very nice recipe…time consuming but it is worth it though.. Thanks for posting the recipe.. I had tried the recipe and its very good. Thanks for posting it. picture looks very tempting. cant wait to try it out. I am about to try it. What is tomato sauce? Tomato Sauce is more or less the same as Tomato Ketchup. Tomato Sauce often has fewer seasonings than tomato ketchup. I tried this and it was really delicious..Now I make this whenever I have a guests at home and they all love it..